Creationists are aghast at suggestions that God may not have put dinosaur fossils and sound designers on this Earth for a joke. And yet a US-based collaboration of sound designers, Heavyocity, ploughs gamely on - gamely being the operative word. Heavyocity is Heavy Melody Music and Sound Design, which supplies audio to the gaming, film and TV industries. 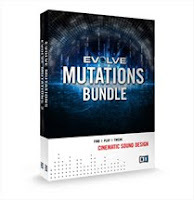 But with their muzo hats on, the HM crew like nothing better than to generate Darwinian sonic mutations in the form of virtual instruments, a pair of which I have right here in the shape of Native Instruments’ Evolve Mutations Bundle, designed for use with the Kontakt sample engine. Get the Bundle and you’ve a €49 saving on SRP compared with buying each instrument separately. It should be emphasised that Evolve Mutations 2 is not a clone, but an augmentation of 1, although it can stand on its own 2 feet. It also sports a new gadget called Trigger FX, but more of this later. Let’s don our palaeontologists’ hats and listen a little more intently. Heavyocity has a mission - to: “Provide cutting-edge, inspiring instruments and sounds that supercharge creativity in ways that enhance productivity”. Gosh! I think the point is that the splatter-gun approach of serving bucketloads of diverse timbres and loops in one instrument tends to frustrate the musical creative. The Evolve bundles are rather more focused and do a pretty good job of making [21st Century cliché alert] ‘go-to’ signature elements available at the drop of a palaeontologist. No sifting through archives of fossilised loops, discarding those that are just too fragmented, mutated or that would lead to sloppy movements if digested. You want something tasty and bold? Cinematic and dramatic? Or soothingly soporific (ambient), and you want it now? The Mutations bundle presents a 600-preset, 4Gb set of rhythms, instruments and ambiences that are quick and easy to audition via Native’s freebie Kontakt Player 4.1. The bundle has a total of eight categories, or ‘Multis’ in Kontakt-speak, so you can pounce on a set of instruments that best suit the project in hand. It could be argued that pre-formatted signature sound sets lead to homogeneity. We’re meant to be muzos, right? Full of original ideas for unheard-of musical meanderings. So the use of signature sounds will have us all sharing the same signature. The security implications are dire. Having been a victim of identity theft myself, I know how distressing it can be to not know who I am any more. Am I me, or is someone else me now? If so, am I nonentity or mutant? Actually, that last question has propelled many a formerly rational individual into songwriting. Back to the point, there are two points to be made. If you’re a sound designer/composer working on a movie soundtrack, music for TV drama or atmospheres for video games, you’ll be acquainted with the torment of something we journos regularly face: The dead line (I use two words for emphasis). Commercial, functional music production doesn’t allow for faffing about, so having rapid access to high-quality, manipulable soundbytes is essential and that’s where Evolve Mutations excels. The willowy artist, meanwhile, who sits in his or her garret of a project studio, whiling away the day messing with the muse and obsessing for days on a single motif may abjure sig-sound resources. However, drop the Mutations into full-phat Kontakt 4.1 (Mutations 2 doesn’t work with Kontakt 3.5), a NI soft-sampler with more bells and whistles than a police campanology troupe, and you’ve licence to go as nuts with a tone palette as Van Gogh in a Dulux factory. Individual instruments from the Multis can be singled out and thoroughly spanked with Kontakt’s powerful preset-pummeling pots. Take a patch that the developer deems quality and mash it to an ear-bleeding pulp in Kontakt. That should assuage the need to establish yourself as an individual, complete with the deep personality flaws that doth a great songwriter make. Time now to ponder the raw materials from which Heavyocity’s Mutations have evolved. We’ve a healthy number of well-rendered samples for the price. In fact, it’s hard to find chaff in either instrument. Big and blarpy, sweet and tinkly, romplingly rhythmic, rippingly fine tones sally forth from the nearfields. Listen to the audio demos at Heavyocity’s site for edification, then consider implementation. The rhythmic content is very well presented, with sets of complementary loops keymapped for on-the-fly creation of beaty beds. Who needs Bill Bruford when you’ve a MIDI controller keyboard and keymapped percussion slices? Along with Rhythmic Suites, there’re Percussive Kits with one hit per key, should you wish to sequence your own patterns. Then we’ve Stings & Transitions, ideal for gluing insanely mis-matched musical passages together, as is often required when scoring for film. Finally, we’ve Tonality & FX making for nifty melodic, dissonant or plain weird passages. And that’s just Mutations 1. Our second Mutation is similarly divvied up into four categories, but offers a load of fresh (phresh?) content and, as mentioned, Trigger FX. This doobrie is effectively a keyswitcher. Play a sound, then tinker with an octave of keys lower down the board to modify such things as panning, delay settings, saturation and the like. If you’re using Mutations 2 as performance instrument, you’ll likely need something bigger than a 37-key controller, but in a sequencing environment it’s ball-bouncingly jolly to set up a track, then drop the controller a couple of octaves and bash the keyswitches during playback while tickling the controller’s knobs, just to see what gives. 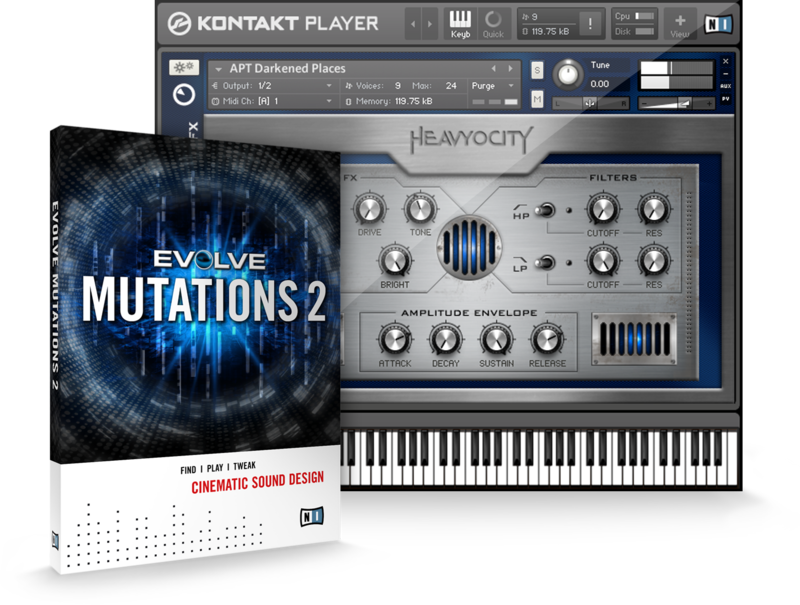 As it happens, there is an un-mutated Evolve available for $309 from Heavyocity’s online shop which brings yet another four-category sound library to the party, along with a built-in step sequencer and arpeggiator. Also, for an extra $29.95 you can upgrade the non-mutoid Evolve to v1.5, which totes Trigger FX, a revised interface and philanthropic promise. Half the purchase price of the upgrade will be donated to cancer research at the Memorial Sloan-Kettering Cancer Center. When it comes to cancer, war is good. In all, the Heavyocity crew has created sterling stuff and Native Instruments has made a smart move in bringing Mutants 1&2 together at such a nice price. 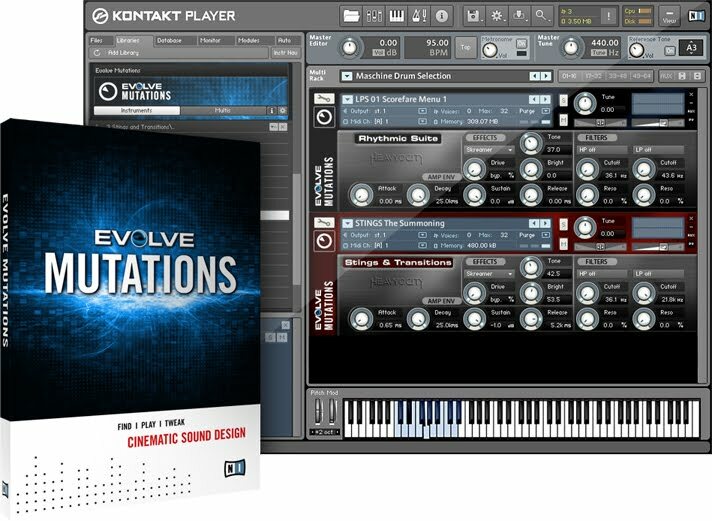 The bundle is a boon for soundtrackers and, with Kontakt, provides an excellent resource for composers and performing musicians, the latter of whom will be ROTFL when they happen across Trigger FX. They may also roll on the floor, laughing. Sure, investing in both the bundle and Kontakt (€379 plus tax, where necessary) will be a pain in the wallet for some, but for the possibilities available, it’s worth skimping on the groceries’ budget, adopting the emaciated look of the tortured artist and saving up for Kontakt 4.1 and Evolve Mutations 1, 2. You’ll likely end up losing hours exploring possibilities, out of the sunlight, locked in your project studio, starving, skeletal, looking like a mutant. Wan, too.